There’s a particular thrill and sense of pride in hearing talented kids from Hawaii performing on prestigious national platforms. On Dec. 2, National Public Radio’s “From the Top” came to Honolulu to record a live show at the NBC Concert Hall. 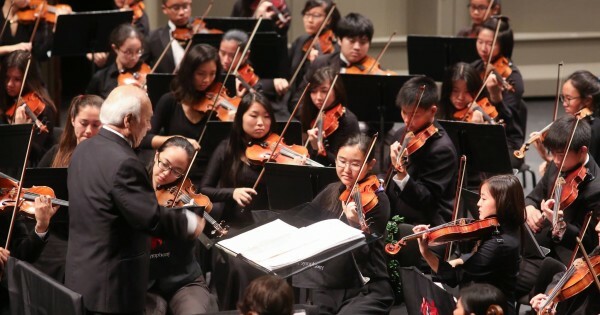 Several students of Musicians’ Union members participated as part of the highly acclaimed Hawaii Youth Symphony 1. “From the Top” showcases performances from the best young jazz and classical musicians in the country and is broadcast on over 220 stations to an audience of 700,000+ listeners. This episode will air 10 a.m. Jan. 21. Congratulations teachers! The Mike Lewis Big Band enjoyed a successful engagement at the Blue Note Waikiki Dec. 6, performing Duke Ellington’s “Nutcracker Suite.” Successful in more ways than musical, it’s also the first time a union contract has been filed for an engagement for local musicians at the Blue Note Hawaii. This venue has been offering low guarantees or a percentage of the door charge only to local musicians. However, they’ve paid millions to contractors and carpenters for renovation work – and pay wait staff, managers, chefs, high-profile national acts, and food and liquor vendors normal fees. Why should local musicians be asked to work at discounted rates?